Monckton | Wott's Up With That? Whither went the warmer weather? “Whither went the warmer weather?“ (2013-12-16). 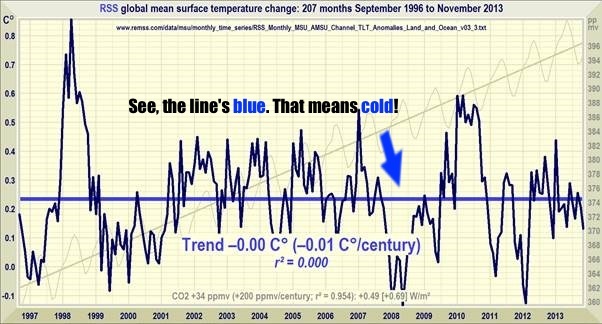 “17 years, 3 months with no global warming” says Anthony Watts, our all-knowing guide to the Universe. He knows this because Britain’s celebrated Morris Dancer of the intellect, Lord Christopher Monckton of Brenchley says so in his usual tangential, conspiracist, long-winded, self-delighted way. He even has a tongue-twister post title and a poem to back him up, who can beat that? Furthermore, the Lord declares that “the models are in fundamental error”, trying to imply that conventional climate science is somehow wrong. As usual he’s too busy pontificating to consider, in this case, the distinction between prediction and projection. Monckton tops it off by jumbling the cautionary statistical aphorism “correlation doesn’t imply causation” into “absence of correlation necessarily implies absence of causation.” That’s logical mastery that rises above grimy reality! Never mind that this November just past was the hottest ever in the GISS record, or that the HadCRUT3 warming trend is pretty glaring if your eyes are open. Look at Monckton’s data! Damn, that’s not flat! 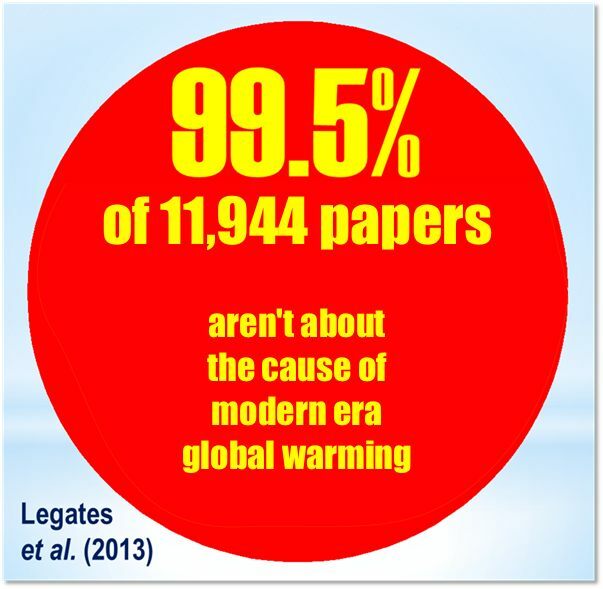 Can’t a right-thinking denialist count on Dr. Roy Spencer? Oh, his chart wasn’t playing the long game, it was just designed to boast about his UAH satellite data corrections (it’s only “fudging” when other scientists do it). Monckton responds to “potholer54” (2012-01-11). Anthony Watts really needs to think about who he associates with. Sure, the comical/pompous/paranoid attention-whore Lord Monckton will bring web hits, but it’s the bad kind of attention. It shows that you’re all about politics and shouting and not about thinking. a former “science writer” who uses a speleological pseudonym “potholer54″ [to] sneeringly deliver a series of petty smears about artfully-distorted and often inconsequential aspects of my talks on climate change. Monckton does a good job of obscuring his argument, but if you strip away the pompous weaselly word play, his 2334 word response to the boils down to yeah, but… and because I said so. So little payoff for so many words. And long ones too! So what can we determine from Monckton’s post? Well clearly potholer54’s penetrating observations have hit home with the thin-skinned Viscount, particularly because he goes to such effort to minimize them. The funny thing is that Monckton’s posts serve as “kick me” signs, his flowery attempts to dismiss his critics simply point us to where his claims are most effectively destroyed. You just know that getting to the bottom of his arch reference in this same post to a “no-account non-climatologist at a fourth-rank bible college in Nowheresville” is going to be worth the Googling (we covered it here). Viscount, shouldn’t you keep quiet about where your arguments are so neatly skewered? We know that you love the spotlight and the sound of your own voice, but you’re really not helping yourself. Anthony Watts helpfully provides the real name of the “potholer54” YouTube account holder in case his readers want to make their life miserable. “I’ve been Lenfesteyed“ (2012-01-03). Anthony Watts thinks the only remedy needed for people who disagree with his version of science and politics is to just change the radio station when a partisan “radio personality” starts regurgitating Anthony’s lies. Yes, as long as Anthony’s misinformation isn’t heard by me it will have no consequence. Lord Monckton, who positively lives for strutting about and stirring things up, has also decided to respond. He’s sent a weaselly letter to the paper containing his usual collection of debunked assertions that he simply expects will not be checked before publication. I howled at his characterization of Professor John Abraham’s truly epic take-down of Monckton’s presentation at Bethel University as a “driveling attempted rebuttal of it by a non-climatologist at a local bible college”. That’s the sign of a puffed-up poser who knows he’s been publicly thrashed. The references to the usual tiny circle of denialist personalities and “supporting links” to his denialist scienceandpublicpolicy.org website and Ken Cuccinelli’s shameful legal assault on Dr. Michael Mann are weak tea indeed. Anthony and Lord Monckton, face it: Being invoked by an ignorant blow-hard partisan talk-show host is the pinnacle of your achievements. “The flying Monck” (2011-12-06). Isn’t that just like Anthony Watts? Warm is cold, up is down, grimaces are grins. The aging and unfit Lord Monckton is so desperate for attention that he actually sky-dived over the Durban climate conference to ‘draw attention’ to climate change denial skepticism. Anthony declares that Monckton is “grinning” on the way down, but you be the judge. Anthony’s readers are equally enthusiastic in their admiration of this demonstration of Monckton’s intellect. Hang on to them choppers, M’Lord. And open them eyes. Actually, this may be Monckton’s primary talent. Oblivious grinning while his arguments are shot down. Note also that, just like in the climate debate, Monckton’s role is to clown for the camera while someone else pulls the strings.